Beekeeping has had a bit of a resurgence lately, and it’s something that I’ve been getting increasingly interested in. 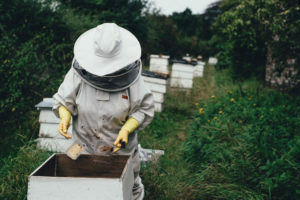 I have a few friends that keep bees and they love the idea of being able to be connected to nature, while learning about a super complex, social animal that can also provide us with an amazingly versatile, delicious product – honey! Unfortunately, these little buggers don’t always take so kindly to us raiding their stores and so we must protect ourselves if we’re going to delve into their little warehouses. A full beekeeping suit is a must for the serious apiarist and I have been informed that they are not all the same! Quality can differ a lot amongst the various brands and you really don’t want to find out too late that your suit can let in bees through the veil or that it is too hard to get in and out of. I’ve consulted with my beekeeping friends to find out what the ‘buzz’ is in the beekeeping suit world and what you need to look for when choosing the best suit. They’ve helped me come up with my list of the top beekeeper suits.